I traveled to the U.P. (that’s what we Michiganders call the Upper Peninsula) on June 7th to attend the graduation ceremony and participate in the yearly on site PAC (Project Advisory Committee) meeting which I currently sit on. I arrived on a beautiful sunny day with temperatures in the mid 70s, a stark contrast from my last trip to the school in mid-April when I awoke to 4” of new snow and 3°F! For those of you who live in the southwest where the temperature has been hot for some time, by contrast, the great lakes finally became 100% ice free the beginning of June. Pat Mahon is the Program Director and Head Instructor of the school so he leads the committee. 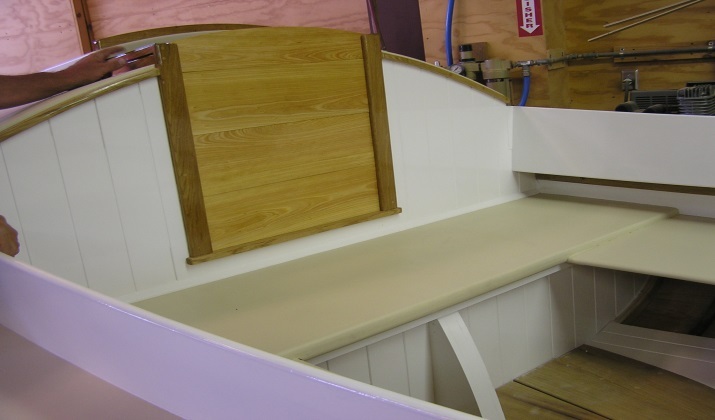 Currently the school has articulation agreements with North Central Michigan College and Eastern Michigan University so students can earn an Associate of Applied Science or a Bachelor of Science degree, respectively, in Wooden Boat building, which gives students access to financial aid and student loans through these schools. The next project for the committee and the school is to become a fully accredited school through the Accrediting Commission of Career Schools and Colleges (ACCSC). The ACCSC is a nationally recognized accrediting agency and is the agency that has qualified the schools that compete with GLBBS for students. Fund raising will soon begin to raise about $10,000 needed for the effort. The big event for the day was the graduation ceremony, complete with a catered lunch and plenty of time for the students to show off their handy work to their families. 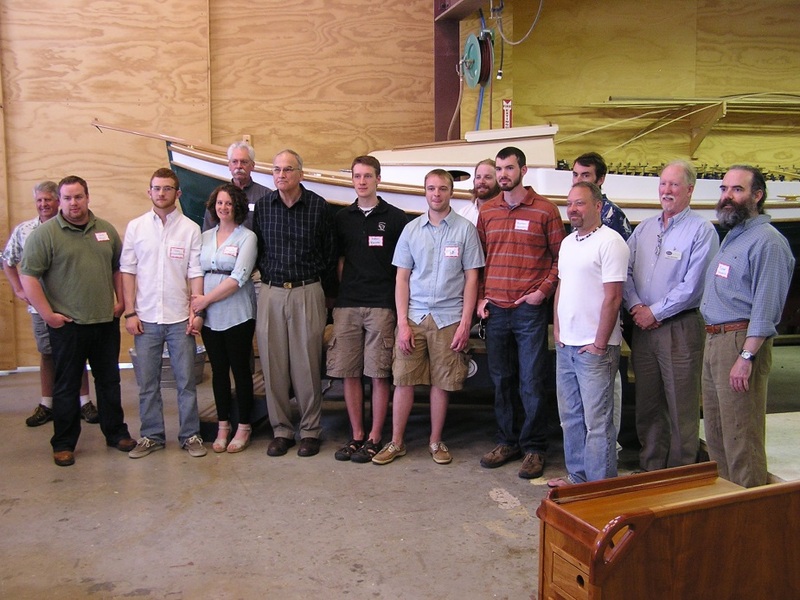 All lined up for the class picture so without further ado, I present the Great Lakes Boatbuilding School graduates for 2014: (l-r) second-year Instructor Andy James, first-year students Gus Bell, Troy Huesdash (second-year) and fiancé Carla Foggin (first-year), Pat Mahon (in back), Del Jacob (second-year), Adam Breister (first-year), Kris Kindt, Matt Edmundson (second-year foreground), Nic Seifert (first-year, bearded in back), back row James Harback (first-year), Steve Ridderman (first-year), Bud McIntyre (Student Services & Industry Relations Director), Michael Gravatt (first-year). Master boat builder Steve Van Dam gave the keynote speech at the graduation ceremony. 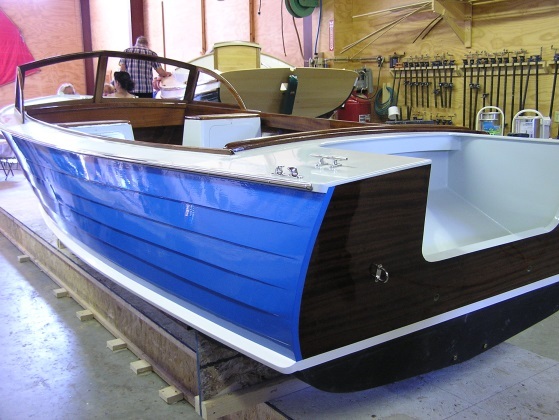 Steve Van Dam is a boat builder who has had his shop in Boyne City, Michigan for decades. He also sits on the PAC committee and this year was asked to deliver the keynote speech at the graduation ceremony. Steve began his comments by saying “I want to congratulate you all for accepting the challenge to learn the skills it takes to work with your hands and build beautiful boats. I also want to assure each and every one of you that you will all fail…” there were some nervous chuckles at that point, but after Steve explained what he meant by that everyone was nodding in agreement. Steve echoed the sentiment I expressed in my article about true American craftsmen, that the trades don’t yet get the credit and admiration they deserve in today’s America. What he meant by “you will fail” was that all craftsmen will develop and hone their skills over time as they progress in their chosen career and by definition that means mistakes will be made. 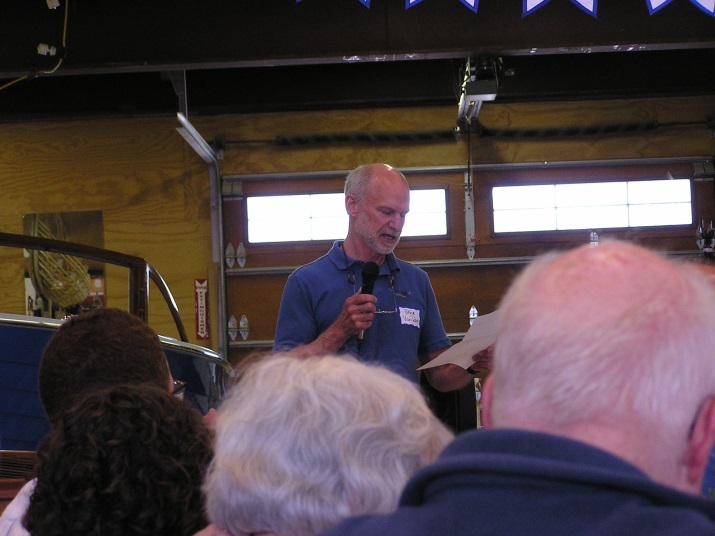 As an example, Steve told a story about himself back when he apprenticed for Vic Carpenter (as did Jan Gougeon, may he rest in peace, and Jim Derck, retired Gougeon Tech Advisor). He was trusted enough after 10 years under Carpenter’s tutelage to work alone on weekends. He was drilling blind holes to mount the chain plates in a new wooden sailboat, using electrician’s tape to gauge the depth of the drilled holes. As many of you probably suspect, he climbed out of the boat only to see that he had drilled holes in the finished and painted hull! His point was that failure taught him an important lesson: own your mistakes and learn from them. He went on to tell the graduates to be proud of what they have chosen to do with their life, what they have accomplished so far, and don’t be afraid to make mistakes and experience the inevitable failures we all endure as tradesmen. Then one day you will have enough experience to convince people that your so-called failure was exactly how you planned it in the first place! The second year students completed the commissioned electric launch. 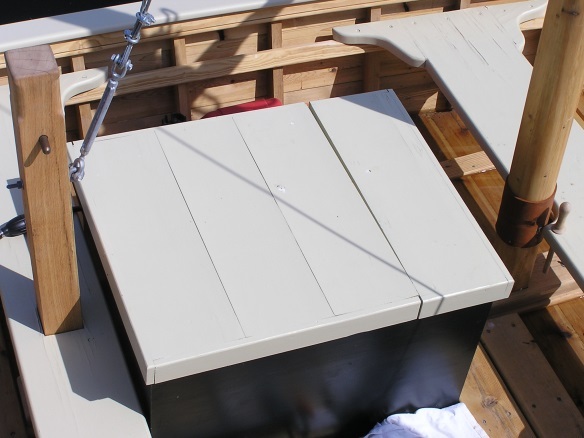 They completed and installed all the deck and interior wood and installed the electric propulsion and battery systems. The result is a beautiful and environmentally friendly launch for the owner to haul supplies to his island cottage and tour around the Les Cheneaux Islands. 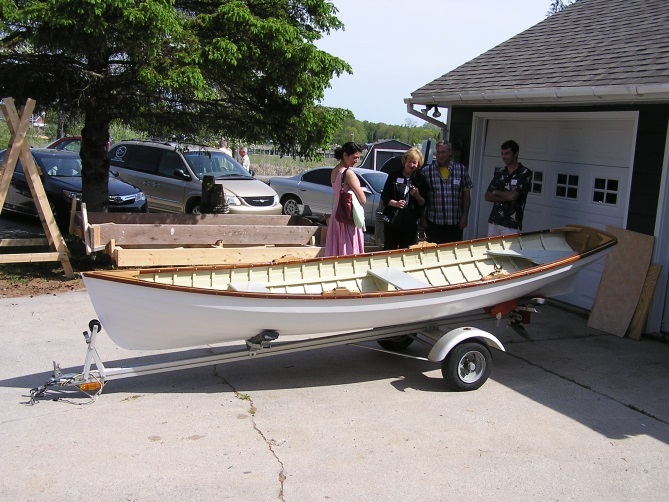 The second-year students also finished the commissioned 18 Tad Roberts Runabout. The paint job and finish work is striking and looks as good as any professional job I’ve seen. The owner is quite pleased with the result. The woodworking and joinery skills the students learned over two years really paid off. 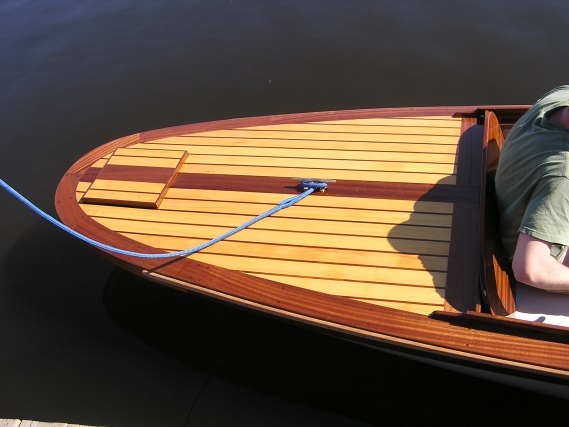 The joinery and elegance of the wooden decks and cockpit are what make this boat especially beautiful. 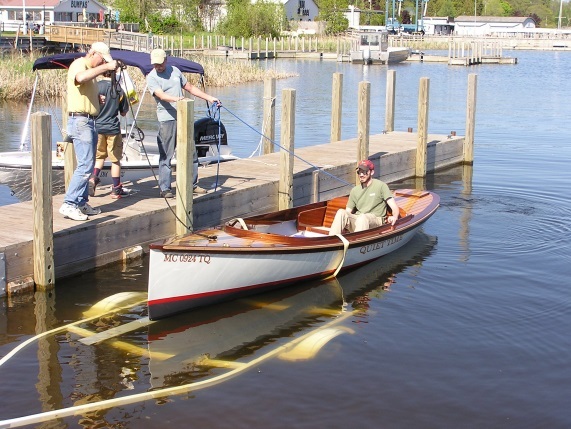 Students lofted, pulled scantlings and then built this replica of the 100-year-old Petoskey Boat Co. rowing dingy. Students completed the carvel planked KATIE adding the deck, house and interior to the boat started last year. 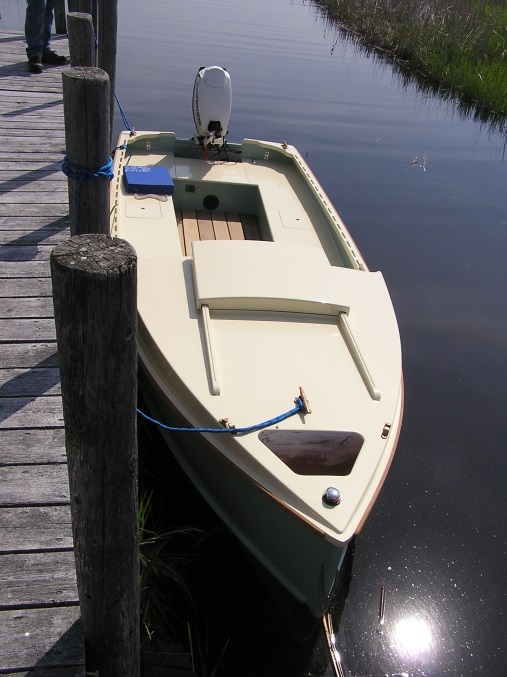 Pat plans to take this boat to the WoodenBoat Show in Mystic, CT.
Because the boat is a workboat, heavily built and finished for work, not show, they were going to leave it as-is for the summer and do some work on it in the offseason. 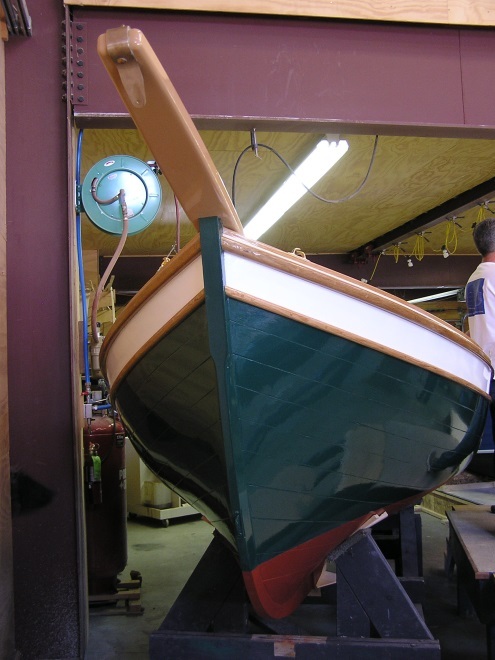 Because the boat is a work boat – heavily built and finished for work, not show, they were going to leave it as-is for the summer and do some work on it in the off season.